Today we read the poetic opening of the Gospel of John in which he proclaims that this Jesus born to a human mother was also the Word (in Greek, logos) made flesh from before the beginning of creation. Psalm 147 praises the God who reigns over creation and provides for it. The use of the word “Zion” reflects the first reading. The origins of the word “Zion” are murky. It may have originally referred to a fortress. In 2 Samuel 5:6-10), “Jerusalem,” “Zion,” and “the City of David” are used interchangeably. “Zion” is most often used as a personification of Jerusalem. The epistle reading today is Paul’s only mention of the birth of Jesus. It is in the context of his ongoing argument about the primacy of justification by faith. Probably the most important thing to note here is that God is the actor. For Paul, the Christmas story is a story about God making himself available to all people. Non-Jews are adopted children and, therefore, joint heirs with Christ. Now before faith came, we were imprisoned and guarded under the law until faith would be revealed. Therefore the law was our disciplinarian until Christ came, so that we might be justified by faith. But now that faith has come, we are no longer subject to a disciplinarian. But when the fullness of time had come, God sent his Son, born of a woman, born under the law, in order to redeem those who were under the law, so that we might receive adoption as children. And because you are children, God has sent the Spirit of his Son into our hearts, crying, “Abba! Father!” So you are no longer a slave but a child, and if a child then also an heir, through God. Today we read the poetic opening of the Gospel of John in which he proclaims that this Jesus born to a human mother was also the Word (in Greek, logos) made flesh from before the beginning of creation. John skillfully weaves together here language from the Greek notion of the primal “logos” with the Hebrew figure of Wisdom. John carefully explains the testimonial place of John the Baptist in verses six through nine. Jesus is both the Word of God and fully human. He “lived among us” (literally, “pitched his tent among us”). In the beginning was the Word, and the Word was with God, and the Word was God. He was in the beginning with God. All things came into being through him, and without him not one thing came into being. What has come into being in him was life, and the life was the light of all people. The light shines in the darkness, and the darkness did not overcome it. There was a man sent from God, whose name was John. He came as a witness to testify to the light, so that all might believe through him. He himself was not the light, but he came to testify to the light. The true light, which enlightens everyone, was coming into the world. He was in the world, and the world came into being through him; yet the world did not know him. He came to what was his own, and his own people did not accept him. But to all who received him, who believed in his name, he gave power to become children of God, who were born, not of blood or of the will of the ﬂesh or of the will of man, but of God. 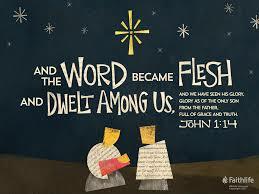 And the Word became ﬂesh and lived among us, and we have seen his glory, the glory as of a father’s only son, full of grace and truth. 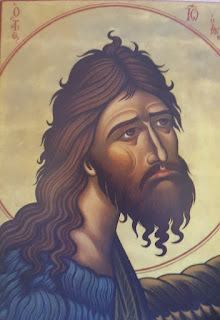 (John testified to him and cried out, “This was he of whom I said, ‘He who comes after me ranks ahead of me because he was before me.’”) From his fullness we have all received, grace upon grace. The law indeed was given through Moses; grace and truth came through Jesus Christ. No one has ever seen God. It is God the only Son, who is close to the Father’s heart, who has made him known. The Scripture quotations (except for the psalm) are from the New Revised Standard Version Bible, copyright © 1989 by the Division of Christian Education of the National Council of Churches of Christ in the U.S.A., and are used by permission. All rights reserved. The Psalm translation is from The Book of Common Prayer. Commentaries are copyright © 2018, Epiphany ESources, 67 E. Main St., Hornell, NY 14843, www.epiphanyesources.com. All rights reserved. Permission is granted to copy for group study. 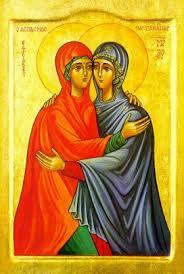 Our Gospel reading is the account of the visitation of Mary to Elizabeth. Micah was active as a prophet in the 8th century bce. during the reigns of Ahaz and Hezekiah, although this latter part of the book may date from the later exile. The vision is of a restored monarchy in the line of David, hence the importance of Bethlehem. Christians have read this text as a prophecy of the Messiah. 5:2 But you, O Bethlehem of Ephrathah, who are one of the little clans of Judah, from you shall come forth for me one who is to rule in Israel, whose origin is from of old, from ancient days. 3 Therefore he shall give them up until the time when she who is in labor has brought forth; then the rest of his kindred shall return to the people of Israel. 4 And he shall stand and feed his flock in the strength of the Lord, in the majesty of the name of the Lord his God. And they shall live secure, for now he shall be great to the ends of the earth; 5 and he shall be the one of peace. Our psalm today is a communal lament, calling on God as Shepherd to deliver the people from their enemies. It follows on the first reading in that it invokes the shepherd image, with Bethlehem in the first reading being the home of the Shepherd King, David. Our psalm today is Luke 1:46-55, Mary’s song upon hearing the greeting of her cousin Elizabeth. Mary’s song closely parallels that of her ancestor Hannah (1 Samuel 2:1-10). She sings of a world turned upside down as her own world has been. She sings also in the past tense, as if justice has already come. In this passage the author of Hebrews uses Psalm 40:7-9 to illustrate how the coming of Christ into the world has led to salvation for all. This text reminds us of the connection between Christmas and Good Friday/Easter. The one leads necessarily to the other. 10:5 Consequently, when Christ came into the world, he said, “Sacrifices and offerings you have not desired, but a body you have prepared for me; 6 in burnt offerings and sin offerings you have taken no pleasure. 7 Then I said, ‘See, God, I have come to do your will, O God’ (in the scroll of the book it is written of me).” 8 When he said above, “You have neither desired nor taken pleasure in sacrifices and offerings and burnt offerings and sin offerings” (these are offered according to the law), 9 then he added, “See, I have come to do your will.” He abolishes the first in order to establish the second. 10 And it is by God’s will that we have been sanctified through the offering of the body of Jesus Christ once for all. Our Gospel reading is the account of the visitation of Mary to Elizabeth. The words of Elizabeth serve to confirm the announcement of the angel Gabriel. The babe leaps in Elizabeth’s womb reminding us that John is subservient to Jesus. Mary breaks into song, a song which closely parallels that of her ancestor Hannah (1 Samuel 2:1-10). She sings of a world turned upside down as her own world has been. She sings also in the past tense, as if justice has already come. The Scripture quotations (except for the canticle) are from the New Revised Standard Version Bible, copyright © 1989 by the Division of Christian Education of the National Council of Churches of Christ in the U.S.A., and are used by permission. All rights reserved. The Canticle and Psalm translations are from The Book of Common Prayer. Commentaries are copyright © 2018 Epiphany ESources, 67 E. Main St., Hornell, NY 14843. www.EpiphanyEsources.com. All rights reserved. Permission is given to copy for individual or group study with this attribution. 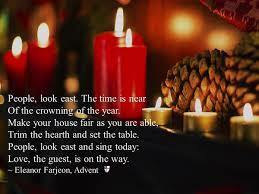 The Third Sunday of Advent traditionally is called Gaudate Sunday, a name which comes from the first word of the Latin Mass introit on this Sunday: Gaudate, “be joyful,” or “rejoice.” The color is lightened to rose, signaling that we are more than halfway to Christmas. Some people call this “Stir Up Sunday” because of the first words of the Collect of the Day. Zephaniah prophesied in the closing years of the seventh century bce. and was clearly influenced by Amos and Isaiah of Jerusalem (“First Isaiah”). These were good years for Israel under King Josiah (640-609 bce), who many regarded as the greatest king since David. The prophets of this time, however, knew that prosperity was being built on the backs of the poor and that the collapse of the society was just a matter of time. Zephaniah himself may have been an Ethiopian, the only Jewish prophet we know of African origin. His writing consists of nine oracles. The first eight are full of judgment and coming destruction. The ninth is our reading this morning, proclaiming that there is still hope for a righteous remnant. Zephaniah celebrates God’s presence remaining with a renewed Israel. 3:14 Sing aloud, O daughter Zion; shout, O Israel! Rejoice and exult with all your heart, O daughter Jerusalem! 15 The Lord has taken away the judgments against you, he has turned away your enemies. The king of Israel, the Lord, is in your midst; you shall fear disaster no more. 16 On that day it shall be said to Jerusalem: Do not fear, O Zion; do not let your hands grow weak. 17 The Lord, your God, is in your midst, a warrior who gives victory; he will rejoice over you with gladness, he will renew you in his love; he will exult over you with loud singing 18 as on a day of festival. I will remove disaster from you, so that you will not bear reproach for it. 19 I will deal with all your oppressors at that time. And I will save the lame and gather the outcast, and I will change their shame into praise and renown in all the earth. 20 At that time I will bring you home, at the time when I gather you; for I will make you renowned and praised among all the peoples of the earth, when I restore your fortunes before your eyes, says the Lord. The psalm is replaced today by a canticle from The Book of Common Prayer (#9). Isaiah 12:2-6 (usually referred to as “The First Song of Isaiah”) is a song of praise that concludes the first major section of the book of Isaiah. It is a song of awaited redemption. It continues the hopeful theme of Zephaniah and leads into Paul’s theme of joy in the next reading. At the beginning of this chapter, Paul called the Philippians his joy and his crown (4:1). Joy is a major theme of the letter, culminating in our passage this morning. How to translate “The Lord is near” is anybody’s guess as there is no verb in the original Greek. It probably ties to the next phrase, “Do not worry…” That makes the sentiment something like, “The Lord is near so do not worry…” The last sentence of the passage is, of course, the traditional blessing from Anglican/Episcopal liturgies. Notice, however, the stronger word “guard” rather than the “keep” in our blessing. The first six lines below follow on the reading from last week and are parallel to the other Gospels’ account of John’s preaching. What follows (“And the crowds asked him…”) is found only in Luke. They describe a very practical following of John’s and then Jesus’ teaching. This is what repentance looks like. It looks like compassion, honesty and justice. John’s baptism was a ritual purification signifying repentance. Christian baptism would develop into something deeper—initiation into the mystery of Christ’s life, death and resurrection and membership in Christ’s Body the Church. 3:7 John said to the crowds that came out to be baptized by him, “You brood of vipers! Who warned you to flee from the wrath to come? 8 Bear fruits worthy of repentance. Do not begin to say to yourselves, ‘We have Abraham as our ancestor’; for I tell you, God is able from these stones to raise up children to Abraham. 9 Even now the ax is lying at the root of the trees; every tree therefore that does not bear good fruit is cut down and thrown into the fire.” 10 And the crowds asked him, “What then should we do?” 11 In reply he said to them, “Whoever has two coats must share with anyone who has none; and whoever has food must do likewise.” 12 Even tax collectors came to be baptized, and they asked him, “Teacher, what should we do?” 13 He said to them, “Collect no more than the amount prescribed for you.” 14 Soldiers also asked him, “And we, what should we do?” He said to them, “Do not extort money from anyone by threats or false accusation, and be satisfied with your wages.” 15 As the people were filled with expectation, and all were questioning in their hearts concerning John, whether he might be the Messiah, 16 John answered all of them by saying, “I baptize you with water; but one who is more powerful than I is coming; I am not worthy to untie the thong of his sandals. He will baptize you with the Holy Spirit and fire. 17 His winnowing fork is in his hand, to clear his threshing floor and to gather the wheat into his granary; but the chaff he will burn with unquenchable fire.” 18 So, with many other exhortations, he proclaimed the good news to the people.